The Can Opener Collection is the first collection to receive a site-specific documentation of a person (besides myself) interacting with an object. The owner of a luncheonette agreed to be filmed using his table mounted can opener. This clip extends the context of this collection not only with an industrial style can opener, but also with the documentation of someone else’s knowledge of operating it. Documenting this performance needed to be completed in a timely manner and organized to fulfill the collections pre-existing characteristics. Loose planning and communication tended to help realize the documentation experience. This planning began with a sketch of the placement layout of the person, the object, written notation of the physical activity involved, and the documenting equipment. The sketch is the image attached to this post. Of course, equipment (camera and lights) is a priority, but a white background was also mandatory to be consistent with the collection’s focus of the social interactions between people and objects. By showing previous clips of the Can Opener Collection to the luncheonette owner, it was communicated that there was a need for a white background in order to block out the overall luncheonette environment. The can opener is mounted on a wooden cutting table and a white background does not need to extend onto the table since this is part of the objects features. The other features that needed to be considered were the activity of the interaction. I had the basic understanding of how the can opener functioned in the initial conversation about the documentation. The sketch only presents the first act of the interaction, which is breaking the seal of the can. The vertical motion of the handle of the can opener being raised and then lowered with force on the can needed a wider perspective than what I usually document from my intimate studio table set-up. After the seal is broken on the can, the handle folds over and becomes the crank that spins the can to open it. A test shot of the height of the handle being raised and the proper distance for the camera visibly showed the white paper background was at the right height and documentation could begin. The performance and documentation went smoothly. 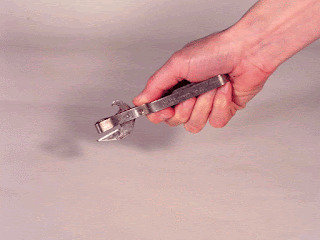 The video clip visually represents the context of the Can Opener Collection. That is of the tangible work from a table mounted can opener opening a can, along with the intangible work of the luncheonette owner’s knowledge of the process to use the tool to open the lid of a can. To view the clip and the May 2012 Recent Additions of the Can Opener Collection please visit the website. The timing of an acquisition depends on the purchase or availability of an object for the collection. Using the Can Opener Collection as an example of the process of acquiring new additions, I intend to recount my experiences. These experiences include receiving an object as a gift, an online purchase of an object, and the documentation of an object at a site-specific location of a luncheonette. These three examples have different stages of timing in forming the May 2012 recent additions for the Can Opener Collection. The first object to be acquired for the May 2012 recent additions was the King brand vintage hand can/ bottle opener. This can opener was a gift to the collection by an acquaintance that was cleaning out a family member’s house. In receiving this gift there was also a dialog over how this object would be used towards the collection. The acquaintance was under the impression I was collecting the can openers as a singular object form. I clarified the can opener collections objective by referencing the video clips of the interaction between the person and the object. The acquaintance didn’t want the vintage can opener back nor did they know how to operate it. Since January 2012 I have been practicing using the vintage can opener before I felt comfortable enough to document the interaction. With this acquisition I needed to spend time understanding how the object functioned as well as obtaining other acquisitions in order to present more than one new addition. My research over the winter of 2012 has made me consider the punch style can opener to be included in the collections new additions. I have been looking to purchase either a wooden handle punch or the stainless steel punch and cover for canned milk. These two styles are specialized for opening can milk and require a different form of physical interaction than the punch and bottle opener that was documented in the November 2011 addition of the Can Opener Collection. The timing of this acquisition has been involved with attendance at flea markets and observing online auction sites. Recently, I have found a Moeller punch and cover on an online site and the starting bid and shipping was within the means of the collection’s budget. The punch and cover has a more direct method of use than the gifted King brand vintage hand can/ bottle opener and I spent less time in practice with the object. The third acquisition did not require me to practice or have the knowledge to use the object. Documentation of a table mounted can opener was obtained with permission from a local luncheonette owner. The timing for this segment of the addition was in scheduling and planning for the performance of the interaction in a site-specific location. Taking into consideration a desire to communicate the collection’s aesthetics and respecting the time guidelines of the business, the process to acquire a video clip of the industrial style can opener was realized. These three experiences of acquiring recent additions have demonstrated the collections management aspect for the collections as a whole. They include management of singular objects and site-specific documentation. The majority of the collection (which is the video portion) only entails the use of the object for documentation of the interaction. After that, the object is no longer needed in the collection. These objects that are acquired by gifting or purchasing will be resold and the funds will be placed in the budget for future collecting needs. In the case of the acquaintance gifting the vintage can opener, the acquaintance had no interest in the object and was more interested in supporting the collections project. In a very similar process, with the site-specific acquisition, the owner of the luncheonette had an interest in the collections. The dialog with the luncheonette owner went beyond the basic concepts of the collections. For the practice of site-specific documentation a model and object release form is utilized to clarify the video clip presentation for public viewing (internet & future public institutions). The release form is the written arrangement and understanding of the participant’s performance and use of their object to the collection. Having formed these collections management practices in the early stages of the collecting process will offer future options for allocations and presenting the collections in a professional manner. I referred to Susan Pearce’s archaeological curatorship methods with the use of the Coupon Collection in the Defining A Collection blog (January 17, 2012). This blog outlines the beginnings of my activities of archiving and management of a collection obtained through a public print media source. Considering the video aspect of the collection is in the beginning stages of including outside participants, I am in the revising stages of the video clip archiving cards. These management practices have brought my attention to include additional detailed information on the archiving cards. The image accompanying the Considering the Accumulation blog (March 25, 2012) is a sample of a video clip archiving card. Along with the video clip number and description of the object in the video, I will include the information of the location of the video (studio shot or site-specific) and how the object was obtained (purchased or gifted). The detailed information for each clip will be notated on an individual basis, since some of the documentation of objects will contain more background information than others. One of my recent readings has been In Flagrante Collecto: caught in the act of collecting by Marilynn Gelfman Karp. In Flagrante Collecto presents the relative value of collections by considering the type of collector and how the objects are valued beyond their functionality. In part of my choosing this book is towards my research on the private collector and public museum collections. One of the prominent objects mentioned in the book that relates to my interest in the collecting process is the Dixie Lid. The functionality of the Dixie Lid is to cover the ice cream cups. From 1930 to 1954 photographs of personalities from that time period were printed on the underside of the lid. Marilynn Gelfman Karp describes the process of licking the ice cream off the wax paper surface of the lid to reveal an actor, actress, baseball player or even a cowboy. She continues the description of the Dixie Lid as ephemera. The lids have a function as a wrapper for the ice cream along with displaying the cultural commodities, photos of personalities of the time period. With a little further research, I was able to find a timeline of the first images printed on the Dixie Lids up till the personalitities. The Southeastern Antiquing & Collecting Magazine offers this timeline as well as values of common lids, vintage, and the lid’s condition. These two concepts of value and the condition of the object tend to be referred to with the interest of a private collector. The only mention of an ephemera print object and the lids functionality is implied in the In Flagrante Collecto book. My research is developing within these concepts and I would like to focus the research towards a present day inquiry of another artifactual object (ephemera print object) to my collection.